I have always been interested in fortune tellers, mediums, and clairvoyants. Recently, after bull riding, Mister, Katarina and I had our palms read by some guy advertising on the street. Since hot air ballooning was cancelled due to weather a second time, I started researching how to learn the craft, if, in fact, it can be learned or whether it is a gift. I had never had my tea leaves read and that was what I was most curious about. My mother-in-law used to read tea leaves (I am told) but she died before we really knew each other (we had only started dating) and I never knew to ask. So this felt like getting in touch with the woman a medium once told me was my guardian angel. She also told me that Mister would never repair the broken gate and I should do it myself. She was right on that so she must be right about the power of the tea. Tasseography has always seemed a little more woolly to me than the Tarot. You can see almost anything in tea leaves–in fact I did see Ellen Degeneres–whereas the cards have specific meanings. Although I can see the value in both. 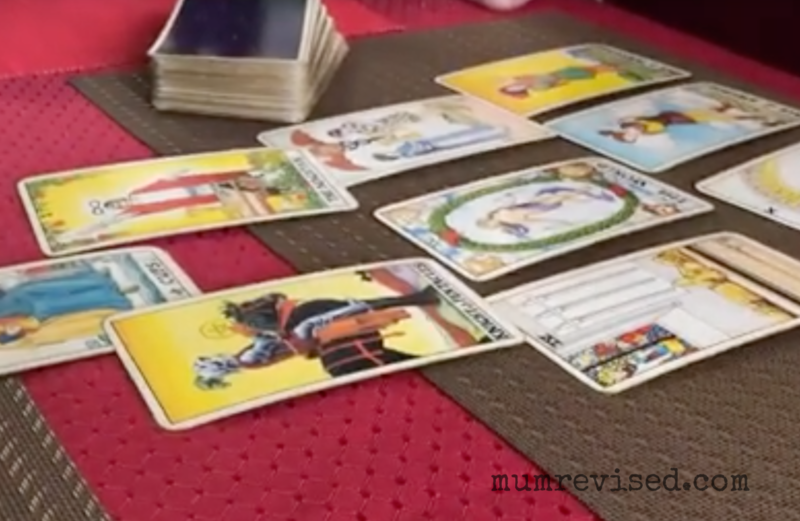 Originally Tarot cards were created for gaming, not fortune-telling, which takes some of the mystery out of them, and with tea leaves you get to drink the tea. I always had an affinity for Tarot cards, but after about 5 “too true to life” occasions (all the negativity you can imagine), I gave it up. Don’t know if it was coincidence or actual ‘psychic’ talent, and didn’t want to find out. Although I could NEVER get a read on myself. It sure would have helped me out, from time to time! Why would anyone read negative stuff? I saw a bit of doom and gloom in one tarot card and I found the light at the end of the tunnel. You need to go to someone with a philosophy for not being the harbinger of doom. If they predict awfulness and it doesn’t come true, what assholes are they? I had a reading once that said my marriage (now into its 23rd year) wouldn’t last to ten years. Jerk.